Dr. Tommi Linnansaari is an Associate Professor at the Department of Biology and Faculty of Forestry and Environmental Management, University of New Brunswick, where he holds the Atlantic Salmon Research Chair. He is also a member of the Canadian Rivers Institute at UNB and he is the Research Coordinator of the Collaboration for Atlantic Salmon Tomorrow (CAST). He did his undergraduate and M.Sc. degrees at the Department of Fisheries and Limnology at University of Helsinki (2003), and received his Ph.D. in 2009 at the Dept. of Biology at UNB. Both his M.Sc. and PhD. theses examined the ecology of wild Atlantic salmon. 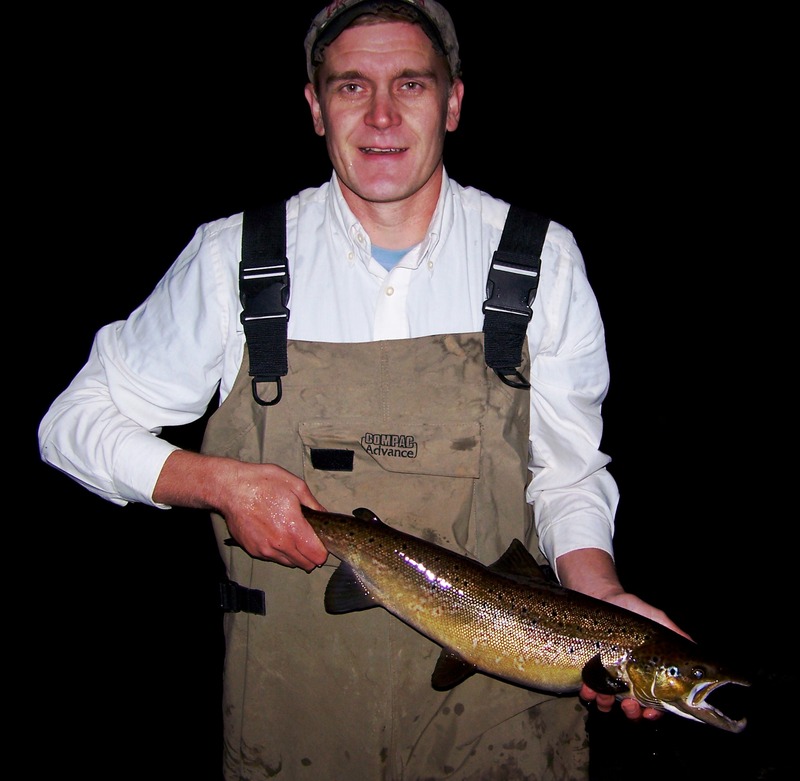 Prof. Linnansaari is a fish ecologist and his current work examines Atlantic salmon ecology, the effects of anthropogenic impacts on rivers related to climate change, hydropower and other manipulations of flow due to consumptive and non-consumptive uses. He is also interested in behavior and movements of fishes both in natural and in hydropower-impacted rivers. With specific regard to Atlantic salmon, he has carried out research on this species in four different countries (Canada, Finland, Norway, Iceland) and in addition to his work in academia, has worked specifically on Atlantic salmon in research institutes (SINTEF Energy Research in Norway, former Finnish Fish and Game) and industry (Stantec Consulting). Prof. Linnansaari currently supervises or co-supervises 9 graduate students, 1 postdoc and 5 staff members (all but one working directly or indirectly on Atlantic salmon). During his career, he has published 64 written works (research papers, reports and book chapters), received > $ 5 million in collaborative research funding, contracts, scholarships and awards from various sources including NSERC, Atlantic Salmon Conservation Foundation, Norwegian Research Council, Norwegian Directorate for Nature Management, Finnish-Swedish Border River Commission, Icelandic National Research Fund, Nordforsk, Fisheries & Oceans Canada, NB Wildlife Trust Fund and industrial partners like NB Power and J.D. Irving Ltd. Dr. Linnansaari was also the recipient of the Miramichi Salmon Association Jack T.H. Fenety Salmon Conservation Scholarship in 2007. It is encouraging to see a number of responses to Brad’s blog regarding the work CAST is undertaking to examine the Smolt-to-Adult Supplementation (SAS) strategy. As is typical for any issue, the opinions range from positive to negative. This is welcomed as only by dialogue any progress can be achieved to improve anything ever proposed. While we do not generally engage in blog-post monitoring, or “quarreling” about the “he said, she said” in social media sites, I have been asked to respond to some of the most common critiques the proposed SAS program seem to be facing any time we talk about it. Again, I am not responding to say people are not entitled to a difference of opinion; I am only responding to address some of the facts that have been misunderstood, or deliberately falsified. Also, note that this response is not directed to anyone, any organization or their supporters, nor it is intended to insult anyone or anyone’s feelings. It is simply for further information purposes for those who may be interested. As our intention is to not hijack anyone’s blog, and the social media really is not the venue for constructive education on this issue, I try to keep this response as brief as possible to simply highlight the major misunderstandings of (some of) the previous replies and those that we commonly hear “on the street”. That being said, I would like to note that some of these misunderstandings are very common indeed and as such, we (members of the CAST science team at University of New Brunswick and Universite Laval) are working on a Frequently Asked Questions section regarding SAS program on our own research website (www.castsalmon.com) that will provide a thorough, and scientific answers to many common questions people have, and, unfortunately, almost always misunderstand. The misunderstandings are in part because of the very successful anti-lobby, however, are also in part because of the concept of SAS, while not new, is relatively hard to understand by those not well versed in potential “effect pathways” in genetics, or in fisheries population dynamics. The FAQ is “in the works” at the time of writing this blog response, however, will be available soon, so “stay tuned”. Soon enough, we will offer these FAQs and their associated answers in a separate website posting because 1) a lot of people are interested; 2) a lot of people are misinformed; 3) some of the concepts will require rather lengthy response to thoroughly understand them; and 4) we do not want to “side-rail” Brad’s blog by imposing this discussion to his site. With that, I apologize that my responses herein are rather short, to-the-point, and non-exhaustive. As said, we typically do not engage in blog-post discussions because (typically) there is no end to such discussions, and, after all, we have science to be doing. While any response herein is in part an invite to ever-so-more answers, I will refrain from further “blogging”, and simply defer to the forthcoming FAQ and answers on regarding the SAS strategy, and other scientific work CAST is undertaking. “Sea-survival gene” (Are the CAST members not aware of fish genetics, natural selection, and the effects on wild Atlantic salmon?). I. Anything anybody ever does incurs a risk. There is a risk of doing something, and similarly, there is a risk of doing nothing. The same applies in the Atlantic salmon population in the Miramichi, and salmon population management in other jurisdictions. The risk of doing something, in this case carrying out research on SAS strategy, is related to “what if there is an effect on the genetics of these fish and it will dilute the natural instincts of the wild salmon”? A valid concern (see response to question 3 on this topic), however, one has to also keep in mind the alternatives. There is also a risk of doing nothing; that is, continue on downward spiral on Miramichi salmon population. Why is there a risk in doing nothing? It is because of an ecological concept termed “inverse density-dependence” or “Allee effect”. Briefly, it is a concept that describes why populations, as they dwindle, may become exponentially difficult to recover after some threshold due to an increasing rate mortality stemming from just the fact that numbers of conspecifics are low. In other words, decline is not constant, but actually becomes aggravated in an increasing fashion (I will defer explaining the concept of Allee effect to our website). Back to the risk of doing something, like SAS for example. Since SAS-type intervention is not a common strategy, it was decided that a scientific review would be beneficial so that the risks and benefits of such programs could be understood. I.e., find out what is already known, what is not known, and try to envision what are the possibilities. This has been done, and a document was compiled by Prof. Dylan Fraser, a fish geneticist and ecologist at the Concordia University. Dr. Fraser was asked to compile risks and benefits, to best of his knowledge, and this working document was then further worked on by a panel of scientists. Importantly, to predict what risks may be involved, it was necessary to “borrow” some possibilities from traditional stocking programs which may, however, lead to “apple to orange” comparisons (See Question 2 below). Anytime you collect a number of respectable scientists in a room and task them with “list all the risks you can think of”, you are to assume a relatively long list. This was indeed the case in the initial SAS review as well. However, this is wherein one must understand what “risk” means. Risk is an outcome that may (or may not) occur in response to an intervention. Risk also comes with a probability of occurrence, or likelihood. In the CSAS (2015) meeting, the risks and benefits of SAS were compiled, however, the scientists were NOT asked to chime in on the likelihood of their occurrence. This is a problem of sorts because the anti-lobby has taken a “risk” and translated that in their own mind to “an outcome that will occur” (which is not necessarily the case). I use an analogy to shed more light on this concept. Let’s say I was going to travel from my home to work. There is a chance that I will never arrive to work because something catastrophic may happen to me during my travel. Some risks that I take every morning are: 1) I may be in a lethal car accident; 2) I may be hit in the head by a meteorite; 3) I may be abducted by aliens on my way. All these are outcomes that a scientist may say may happen if I undertake my activity (travel); they all are risks. However, since they are risks, none of them may occur, AND, importantly, they occur with different likelihood (for example, compare the risk or a car accident to that of alien abduction; I would say they come at a different likelihood, but not all will agree). My point is, it is an important to compile a list of risks that may occur when planning an activity or intervention, however, risk does not mean it is a guaranteed outcome (as I write this at work, none of the risks that I undertook this morning transpired, and the aliens will have to take another stab at me). Such list of risks is extremely useful because by knowing risks, one can devise a plan to 1) avoid those risks, or 2) at least monitor them such that if there is any evidence of those risks actually transpiring, then one can cease activity. To follow my analogy, if I see that a meteorite is going to hit a certain intersection, I will not go there, and thus I stay alive. The proposed research program on SAS is designed in this fashion; look for risk factors at play, assess, and mitigate/cease activity if necessary. How does this relate to CAST’s SAS program? Well, the SAS program was designed in response to the questions posed in Dr. Fraser’s excellent document (and an accompanying research advice document) such that we would be able to truly understand whether SAS may be an efficient recovery strategy. It gave us two important “take-home’s”: 1) The questions that urgently require answering (for example: quantify and compare the lifetime fitness of SAS progeny versus wild progeny in the natural environment to examine the extent to which SAS may reduce marine adaptation. It was one of the risks listed, but there is no guarantee it would ever happen; See Question 3 to address this issue). So, we (CAST) are only trying to answer the questions that the scientific community thought are important; 2) The risks that are important to keep an eye out for, for example, ensuring we designed the proposed program to avoid non-random selection when smolts are collected, avoid non-random die-offs during their time at facility, avoid (and monitors) unintentional selection, monitor for any evidence of epigenetic changes, diseases, changes in phenotype. When it is time to release fish back to their river of origin (remember, we did not do anything to this fish in hatchery; we simply kept it alive) we know if there has been an issue with regard to these factors and a safe decision can be made if a release is advisable. I understand that many terms in the passage above make the general reader go “WHA?. It is OK for now because we recognize the need to translate the “lingo of science” to lay terms, and we will be doing so in the FAQ on our own website. To continue the storyline, the SAS proposal CAST devised went through another review by a panel of international scientists who were chosen by their merit. The CAST proposal was dissected, and yet another document was drafted where additional risks and benefits were compiled; those missed by Dr. Fraser’s initial (well-written) document (note my previous comment what happens when you close two dozen scientists in a room for two days with the objective of “find out if there is something more that can be done”: there is always something the intellects will come up with!). CAST implemented or agreed to all proposed suggestions. To bluntly say that the proposed program by CAST SAS program “will for sure have effect on X, and effect an Y, guaranteed”, is another way of saying “the two international panels of experts who have been gathered based on their merit to evaluate the CAST proposal, and its risks and benefits, are fools as they missed X and Y”. Having been present in both of these meetings, I would say it is a bold statement, as the caliber of scientist that undertook these assessments was significant (my opinion). II. When talking about the SAS strategy, one also must say a few words about “stocking”. A lot has been said among the opponents of the SAS strategy along the lines of “stocking is bad; only use as last resort; stocking weakens the genes; do not the CAST people follow the literature with wide evidence of these harmful effects of stocking?”. It is not one or two scientific articles that has been forwarded to my attention documenting various aspects how wild and stocked fish are different whether using genetic, epigenetic, or phenotypic evidence (again, hard terms to grasp, I understand, but for now, let’s just say these are different mechanisms how fish may be different). We know this, we agree, and that is EXACTLY THE REASON why CAST decided it is about time to think outside the box and do something DIFFERENT. We, in fact, are NOT a “pro-stocking” initiative. Nor we are “anti-stocking” initiative. But we ARE a “pro-science” initiative and are suggesting it IS time to move forward and at least see if there is a much better alternative to traditional juvenile stocking. This response may surprise a whole lot of the anti-lobby, but remember they have not once contacted us to find out what we are actually proposing and why, at least since drafting very early, initial ideas prior to the peer-review meetings. This is the part of the discussion that I refer to as the “apples and oranges”, i.e., the mistake of comparing lessons learned from traditional stocking programs directly as applicable to SAS strategy. Talking, and informing oneself, about stocking practices is difficult even without bringing SAS into the picture. Stocking practices vary, anywhere from keeping broodstock in a hatchery for multiple generations, and “pumping out” juveniles of various stages to wild where they are hoped to supplement populations, to perhaps more benign variants where the broodstock is collected annually from wild, and the resulting progeny are released to wild as soon as it is feasible (often as “first feeding fry”). The story is further complicated with aquaculture escapees that are known to be genetically very different from wild fish, and that some people may mix into concept of “stocking”. For an un-educated reader, all of this is “stocking” and it is all the same, although what one really is looking at is supplementation activities that vary on a gradient in their resemblance from the wild fish. Nevertheless, these traditional stocking activities share something in common; mature fish are held and their gametes (the eggs, the sperm) are crossed in captivity to make “babies”. The decision what eggs, and what milt is crossed to make these babies is decided by a man (or woman); a person. The choice is not by fish. There is indeed evidence this may lead to no good. How would your daughter like to be matched with a guy who you (and not your daughter) chose? Try it, may not go down well. These stocking activities also share in common the fact that it is the early part of life that is in the hatchery environment, and because of this there tends to be “selection” towards the hatchery environment, whether genetic, and with a growing evidence, also epigenetic (this is because mortality may be severe during the early life stages, i.e., selective pressures are high). As the surviving individuals are then stocked into the wild, it should be no surprise that the efficiency of such programs may be low. These are individuals that were born in captivity and were selected towards that environment; the longer you keep the fish in hatchery (fry, parr, smolt, or multiple generations), the higher the change of “adaptation” to hatchery realm. Evidence for this is wide, convincing, and comes from all aspects of studies. Including our own peer-reviewed studies! Before moving on to tell about “why do you then propose to carry research on SAS?”, I want to mention a few more important things just to complete the “stocking” story with reference to some earlier blog posts. First, there seems to be some concern that CAST is proposing on “starting stocking” in the pristine and wild Miramichi River. Just to set the record straight, stocking activities in Miramichi are among the longest known in Atlantic salmon rivers and have been undertaken for decades. The stocking history in Miramichi is “rich” indeed, with various life stages and quantities ranging from a few thousand to hundreds of thousands annually over the past multiple decades. Further, there have been times (early on) where outright rampant stocking activities were undertaken by bringing salmon from other rivers, like the Restigouche and the Saint John River, to Miramichi to “get bigger fish”. While the current activities are from the most benign end of the spectrum, and their efficiency and consequences remain unknown (although CAST is proposing to simultaneously examine the effect of traditional juvenile stocking, as we were going to evaluate the success of SAS program: talking about killing two birds with one stone! ), there is an ongoing, albeit small juvenile stocking program in the Miramichi River (wild broodstock collected every year, stocking of first-feeding fry to rivers of parental origin, in areas where contemporary density is extremely low). In terms of genetic differentiation between the various branches and tributaries of the Miramichi, like the Northwest, Little Southwest, Sevogle, Dungarvon, Cains, Southwest etc., I am afraid that there is no genetic difference between these stocks, based on the peer-reviewed publication by CAST (if you are interested on this, please find the article by copying this to your browser DOI: 10.1111/mec.14965). This is not to say there is no local adaptation, but this IS to say that genetically speaking, there is no “Northwest salmon” or “Southwest salmon” like one (including ourselves) may have assumed there would be in the river system size of the Miramichi. So, to be sure, CAST’s SAS program will not mix the tributary-to-tributary genetics; it’s not there to start with. Second, if stocked juveniles are as bad as we are lead to believe, then there surely would be no evidence that an Atlantic salmon fishery could not be revived, or established from such “inferior” things. Well, the Icelanders fishing the Langa and Leirvogsa may disagree, as an example. These two rivers were jump-started from 0 with traditional juvenile stocking (of other genetic stocks), and while their population genetics still reflect that of their parent population, the stocked juveniles created these healthy salmon runs. These are important to keep in mind, not to promote stocking practices, but to just show evidence that the world is not as black-or-white as the anti-lobby may be leading us to believe. Finally, if juvenile stocking is so bad, can it outright destroy a salmon population? I.e., is stocking “the vermin” we are lead to believe? Let’s look at the example from my native homeland, Finland. There, in the River Tornionjoki, salmon population was not faring particularly well in the 80’s and 90’s. Juvenile stocking program was called to rescue, and a broodstock was kept in multigenerational captivity and various life stages were stocked from fry to parr to smolt. Thorough monitoring of the stock status was continued, and evidence compiled as a PhD thesis by the lead investigator Dr. Romakkaniemi suggested the stocking was doing nothing to improve the populations (for more info see https://helda.helsinki.fi/bitstream/handle/10138/22041/conserva.pdf;sequence=2). The large and long-duration stocking programs were eventually discontinued, and other fundamental issues were addressed by the government. The Tornionjoki River is currently one of, if not the largest Atlantic salmon producing river anywhere in the world. So, even if a multidecadal juvenile stocking program was implemented, it was concluded that while it did not do anything to recover the population, it did not prevent further recovery. Again, it is just important to keep in mind as there seems to be a contingent who leads us to believe that all is lost once a stocking program is initiated. OK. I think I am now ready to resume to tell you about SAS, and why we think this may be a fundamentally different recovery method as compared to just calling and “mixing” it with “stocking”. In fact, instead of “stocking”, perhaps we should call it “staying alive” program. Remember how in the above sections I alluded to problems that seem common in traditional juvenile stocking programs? Man making the choice of pairing, and the fish undergoing a selection process towards hatchery environment during the early life-stages where mortalities occur? Well, SAS completely bypasses these events. Remember what the basic premise of SAS is? Take a WILD smolt, with a WILD gene, then keep it alive to maturity, and release back where it came from, and let the chips fall as they may. A program manager is NOT making a decision whom the released salmon will spawn with; we call this free mate choice. In addition, we do not determine where the salmon is spawning, other than we know it is in the wild nature. If they (SAS salmon) spawn (and they have their natural instincts, driven by natural hormones to do so) then the eggs with the wild gene are in the gravel from the day 1, AND are subject to the force majeure: Natural selection. If they are inferior, nature “deals” with them; they die. If they are good, they survive, and start their natural selection process in the natural environment. In other words, all we did was we ensured the fish got to see the happy day of spawning (and happy it is). We did NOT intervene with the gametes (the eggs, the milt) like a traditional hatchery program does, nor did the young fish experience even one day in a facility. I am not saying the program would not be without potential risks; I started the response by shedding light to that aspect, and we are looking into every aspect where these risk factors could be arising, guided by the valuable documents and advice given to us by the international experts. But how about “relaxed selection” during the marine phase of life? The wild fish that CAST kept in a facility and did not allow to go to ocean “must” (so the story goes) be inferior to wild fish, because the fish that did their journey were “selected” by nature as winners to survive that journey. The fish that were kept in the hatchery were not subject to this treacherous journey, and thus “any dummy” survived and now is able to “infestate” the Miramichi with its diluted gene? Do the CAST members not understand a simple concept like this? This takes me to my last, and third, line of though in this brief answer to some of the common critiques. III. Dilution of the “sea survival gene, or instinct” in a SAS program; how concerned should we be? This line of though is the “favorite” among the anti-lobby of SAS because it is a valid risk (see above what “risk” means; risk is not a guaranteed outcome). But here is what is known so far, followed by an offer for a couple ways to “mitigate”, if you will. I will start by using another analogy; this time an analogy of warfare. Imagine being the first man in line on a landing craft on your way to Normandy on D-Day. Gates open, machine-gun rapid fire starts. Right off the bat some men die, but some survive. Did the casualties not have a warfaring gene? Or was it a “coincidence” that the man on the front of the landing craft was the first one to get the bullet? I have not studied this (and I do not think anyone did), however, there is a possibility that the process of dying would have been what we’d call “stochastic” or “random” circumstance. Continuing on the beach at Normandy, some men were literally blown up to pieces by various grenades, shells, bullets; they faced a gauntlet of mortal risks. Simply put; some die, some do not, and “being at a wrong place at a wrong time” may have had something to do with it. Although admittedly an immature analogy, similar thing is to be expected to be at play also with salmon; the example is not unlike the salmon smolt entering the ocean. Certainly, if a soldier entering Normandy was an extremely, say, fat and slow (and for the sake of an argument, let assume his condition was a consequence of a genetic condition he had), he probably had a much higher likelihood to not be able to return from Normandy. This would be the same for a salmon population; if unfit individuals entered the marine realm (and the misfit was genetically determined), yes, these individuals would be selected against in the marine environment, and would “disappear” from the population. However, consider this: When the Allied sent men to Normandy, it was not a random selection from the generic population; boats were filled with fighting men who would have what it takes to face the horrors of the beach ahead. Similarly for salmon, one cannot forget the smolt population headed to the ocean is a result of > 10 000 years of selection; you do not have the “gene” of fat and slow entering the ocean, similarly as there were no unfit men in the landing craft on the way to Normandy. Any “single gene” which would determine whether individuals survive at sea would be expected to have already become completely selected (i.e., all individuals carry the successful survival version). So, the SAS program is “picking” from a pre-selected pool of thousands of years of selection; the “fat and slow” gene was eliminated thousands of years ago already. So, were those men who survived Normandy genetically different composition than those who entered the beach? I do not know that, but it seems there probably was a “stochastic” component involved and the survival was not determined by the genetics alone. Are the salmon entering ocean, then, different from those that are coming back? Well, luckily, one of the CAST scientists (Prof. L. Bernatchez, Canada Research Chair in genomics and conservation of aquatic resources) has actually looked into this very issue with his associates. Without going too “technical” for a blog post, I will paraphrase and say that they did not find a “sea-survival gene”, but instead the factors influencing marine mortality were not governed by temporally repeated selection. In other words, selection in marine environment is through small changes at many genes but it is also spatially and temporally variable likely reflecting different pressures in different years so relaxing this selection will be unlikely to have a deterministic effect on SAS offspring survival (for full disclosure and to learn more doi: 10.1111/mec.12798). So, combined, the thousands on years of selection before by-passing (only) one journey to ocean, and the evidence that selection in marine realm is on variable set of genes and is variable between years indicates that the relaxing of natural selection in SAS program may not be as large of an issue that we are lead to believe. However, I will play a “devil’s advocate” on myself a little further. Let’s imagine for a moment and say there actually was a deleterious relaxation of the sea-survival gene that was immediately at play because we prevented the sea-journey for a small number of randomly selected fish that have been subject to natural selection for thousands of years. So now what? We released a SAS fish, (in our imaginary thinking hypothesis) that now is in the Miramichi and swims around without “the sea-survival gene” and thus dilutes the population. Hold on a second…so, the SAS parent passes this “lack-of sea survival gene set “ to its own progeny (it’s not like it jumps into a neighbors’ kid like the influenza-virus; that is NOT how genetics works). So what? Then this progeny, spawned into the natural environment from the day one, born and raised wild, may smoltify and migrate to the ocean. So, if our logic is then correct, this smolt (because its parents were SAS, and the poor fish is now “without the sea survival gene”) enters the sea but is rapidly going to meet its end because it does not have the gene it needs to survive. So, it will not come back; under our hypothetical thinking-game, it will only be the smolts produced by the wild parents that would have the sea-survival gene, and only those would be able to return. So, even if there WAS a problem, it would appear the problem is “self-correcting”. If the SAS program dilutes the instinct of survival in sea, then it will translate into a SAS program inefficiency (a lot of work without any measurable increase in salmon population when the adults return) but not into genetic effects that are forever destroyed, again, as we are led to believe by the fear-mongerers. To reduce the likelihood of any negative consequence even further, we have also offered that the program could be a “SAS female-only” program (we would not release any SAS males); in this scenario, the eggs laid by wild females could not get “infested” by the SAS males, so it would not result in a “contamination” of wild eggs. We have offered this as an option not because we are worried there would be a negative effect, but rather as an olive branch to get something going so we can collect the evidence we need regarding this program and show that SAS progeny come back from sea alive and well; call it “mitigation before we know there is even need for mitigation”. To no avail. Now, we could continue on various other aspects, variations, “yes-but’s” regarding the CAST SAS proposal. We have said there are unknowns in the program, and we are not saying a SAS salmon is an equal match to wild salmon in terms of reproductive output. This does not matter, as long as the inefficiencies are not genetic or epigenetic (inheritable). Arguably, there is a lot more to explain so that a fellow-citizen can thoroughly understand the intricacies of the proposed program. However, and as said above, we are working on producing a more thorough answer on our own website to those questions that most often puzzle people who are interested (or who have been misinformed) in this program. For now, we are collecting evidence on the program in laboratory environment and the Experimental Stream as covered by the original blog posting. We continue to do so out of our interest in science and the well-being of Atlantic salmon. Yes, CAST members (at least those at UNB) are keen anglers, so there, that is our “vested” interest if you are looking for one. That, and the desire to do science (and frankly, we are not big fans of the “politics” that is imposed on us by various “players”). Time will tell what will happen with the proposed program. Perhaps some form of it will be implemented by some organization or coalition. Should that happen, the CAST members at UNB would be happy to monitor the outcome, if we were allowed to do so. But, as I posted earlier, we can only help if the help in wanted. It is stakeholders, rightsholders and governments who will have to make a decision what is best for the Atlantic salmon population in the Miramichi. A very insightful reply to the questions that have been asked ever since this program was developed…it seems to me that this should satisfy many of those who oppose this SAS program, we can only hope that it will go forward very soon..it seems to be the best shot we have to increase populations……the govt. has allowed many known harmful programs such as the cage system farms…..it would seem to me that this is likely to have the opposite effect that the farms have had…..it certainly would be a plus for all concerned if the politics(money interests) could be left out of the decision…. many thanks to Dr. Tommi Linnansaari for his efforts to clear this up……. I read the article by Dr Linnansaari with great interest. I’m an NB native, science guy (geologist) and passionate salmon fisherman. I’m not a geneticist but I understand the basics and the statistical elements of the discussion. The program isn’t creating “concrete runway salmon” as a couple commentators have alluded. It isn’t surprising to me to see lots of equally passionate fisherman choose to ignore the detailed science elements of the SAS program in favour of their personal non-scientific biases. In my days in the mining business it was often the case where strident non-scientific, sometimes hypocritical, anti-development biases were able to “shout down” the detailed science basis of a project or development. I think we should be doing all we can in a well-designed, peer-reviewed, scientific manner to counter the challenges faced by the Atlantic salmon, specifically those beyond our control such as climate change, predators like seal and striped bass (to name two) and foreign fishing fleets (at least partially mitigated in a recent announcement). I don’t think anybody out there is really against doing the best thing for the species and therefore our sport. I’m an optimist that the best scientific, political and financial minds will come together and do the right thing – eventually! And I put my money where my mouth is, I just bought a camp on the Cains! Brad, Again, Thank you for asking Dr. Tommi Linnansaari to provide such a clear explanation of the CAST program. I just spent the last 1 and 1/2 hours carefully reading his remarks . It was really what I have been looking for and supports my previous understanding of how it differs from the usual concepts of “stocking”. As I understand it, there is an ongoing carefully monitored stocking program in Machias which follows the recommendations of a hatchery supervisor who helped revive the salmon run in the Taye River in England. This program releases young salmon from hand picked adult eggs and milt that were raised in a hatchery. Brad: Thank you very much for your blog in general and your willingness to encourage responsible analysis of proposed means to help what appears to be a struggling Miramichi salmon population. None of us wants to promote untested and potentially harmful solutions, but I continue to be disappointed by the negative responses (or withdrawn support) that often greet well documented potential solutions like the CAST program. I can only subscribe the opposition to either a turf battle or “not invented here” syndrome, especially after reading Dr. Linnansaari’s excellent synopsis. I think I can speak for Black Brook Salmon Club when I encourage you to both keep banging this drum and persist in your outreach efforts to bring those opposing the program over to the supporting side. Brad, thank you so much for your commitment to sharing knowledge with all of us. Dr. Linnansaari’s comments were very insightful and convincing. Let’s all hope this will lead to action soon to support a thriving Atlantic salmon population on the Miramichi. Here once again is a good idea to bolster the salmon stock in troubled waters of eastern Canadian rivers.The problem is the federal government is once again taking the position of not looking outside the box, and instead takes the decision of eradicating our salmon by not using common sense. I realize there is need for governance,however science and politics don’t mix. I wish the program success and we need more input from people who have valuable experience and education. 1) Are there any other restoration efforts/programs or ideas, outside of Eastern Canada, similar to SAS in practice today anywhere in the world of Atlantic Salmon management. If so what is the evidence/success of these efforts to date? 2) If the answer to question 1 is no than I suggest why don’t we put our preconceptions and judgements aside and wait and see what results are produced by this new concept on the experimental river! 3) I would add also that even if SAS is a roaring success how does anyone believe it will enhance the salmon run population if nothing is done about improving the current low level of survival of wild smolts discovered by the ongoing joint MSA/ASF smolt survival studies? 4) Why doesn’t CAST concern themselves with researching the causes of the increase in predation of smolts in the Miramichi compared with other New Brunswick rivers like the Restigouche? William – I will ask Dr. Linnansaari or one of his associates to answer these questions for you. I do know that CAST has been looking at the predation of smolts in the Miramichi. There is a question as to how accurately the current smolt predation study really reports the problem since the techniques used only show predation on the tagged smolts which may be much higher than on untagged smolts. Just found out that the aboriginals from the area must give the green light before any progress can be made. I understand that aboriginals must be consulted but the time line to see if there is any positives for this program is a narrow window. I just wish if the people who are important in such discussions have any alternative solutions to the problem and are willing to share there views and put there reputations on the line. In response to the last two comments, I would add that this is why I put these last two blog threads together. Dr. Linnansaari’s very understandably written comments needed to be read by as many people as possible. I admit to not being a scientist, but I have studied and followed salmon biology for many years. And from years in business and volunteering in not-for-profits I have learned a little about organizational politics, even though I am not particularly good at them, and in fact have a very low opinion of them in general. I’m not really certain what the the anti lobby that Dr. Linnansaari speaks of is motivated by, but I am completely certain that these attempts to groundlessly undermine CAST’s credibility are not at all helpful to the salmon population of the Miramichi River. One would hope that what should be a science-based arm of the government like DFO would see through this vale of smoke and grasp the facts of Dr. Linnansaari’s arguments and proceed. Perhaps the information being gathered on the Experimental River will give DFO sufficient confidence to move forward with the CAST SAS program. An old mentor of mine in business loved to say that “the truth will prevail.” Let us hope that he is right. One thing is for sure. I will do my best to follow the developments and bring them to the attention of anyone who will read my blog. Brad, Your blog is crucial for those of us that love the valley of the Miramichi and the Atlantic salmon. You have a scientific mind AND the ability to connect with people and you obviously love the Miramichi. I would hope that the Eel Ground Chief, George Ginnish takes the time to read and enter into our discussions. How he can say that there is no imminent danger of the salmon population collapsing when in 1992 the total population was 186,000 and last year was 27,000 is not clear to me. And the numbers of grilse caught at Black Brook in 1918 are the lowest ever. As Dr. Linnansaari noted, there is an Allee effect – “the decline [of the salmon population] is not constant, but actually becomes aggravated in an increasing fashion” and “there is a risk of doing nothing, that is continue on a downward spiral”. With the explosion of striped bass in the Miramichi and with these fish inhabiting upriver pools, I do believe that the future of Atlantic Salmon in the Miramichi is dimm. I cannot understand how Canada allows one group of people to have the only say in these discussions. As an American, I would call it a dictatorship. On my last visit to the Curtis fishing supply shop in Blackville, the owner was very frustrated because despite years of meetings with government officials, her concerns were not heard. And that goes for the fishing lodges, guides and many who gain their livelihood from the Atlantic Salmon. Failure is by definition the inability to make the right decision at the right time.My experience is that when people are put in the position of responsibility and failure occurs then there are two types of people. The person who learns from there mistakes and the person who continues down the path of denial. The comment made on the issues that face us regarding the proper direction DFO should take reguarding the future of our salmon stock on the mirimachi have been heard by the federal government, however a common sense approach seems to be not present. I believe that when it comes to living spieces being negatively affected by political decisions then failure has occurred, let’s hold the government accountable and instilled harsh penalties against the people who are representing our interests. I appreciate the opportunity to voice my opinion and pray that the right decisions will be made. I’m coming late to the party, Brad, but it is so good to read right through the above and the comments too. Heartening to see the level of commitment (writing from the UK) that is present Canada-side, and as the business mentor said, the truth will out, I’m sure of that. Certainly hope for that which could quickly turn into giving this a go. Just on the cost of SAS, small scale hatcheries – fish in tanks – can be done in a very economical and also successful way (it emerged when I once visited and wrote about a River Fowey hatchery in Cornwall, UK) although the scientific monitoring would involve people costs but in a great cause. With the considerable history and natural history even of the NW and SW Miramichi rivers and the considerable past stocking initiatives therein (many in the salmon fishing world do not undersand that the Victorians and Edwardians were stocking the great Scottish rivers systematically in the 19th century into the 20th), the SAS plan sounds like, well, a plan. Hard to disagree. Dr Linnansaari certainly makes the science of ‘eco risk’ accessible/thanks, plenty to chew on but chewing ain’t enough these days so if the plan needs acting on, lets do it but in a coordinated maxed out way that really will make a difference that can be measured (by the ‘science guys’ but also the fishers) in due course.